The final U.K. stop on the Who's 50th anniversary tour will be commemorated with Live at Hyde Park, a concert film scheduled for a theatrical run later this year. The band shared the news on Facebook, noting that the documentary and live film will debut on Oct. 7 and present the June 26, 2015, show with additional behind-the-scenes footage: "Come and experience (or relive!) all the greatest hits on the big screen. Plus Pete Townshend, Roger Daltrey, Iggy Pop, Robert Plant, Johnny Marr and others share their stories of the band’s history and influence as legendary pioneers of British rock." The Who: Live in Hyde Park is presented by Eagle Vision, whose site promises a viewing experience that "will take their audience on an ʻAmazing Journeyʼ through their entire career from classic albums such as Who’s Next, Tommy, Quadrophenia, My Generation and Live At Leeds up to the present day." Billed as the group's "fourth and possibly final" appearance at the venue, the Live at Hyde Park gig capped the U.K. gigs booked on a tour that singer Daltrey described by saying, "This is the beginning of the long goodbye." As previously reported, there are no further plans for the Who to tour on this scale, and Townshend has recently suggested that he might be ready to completely close the book on further performances under the band's name. 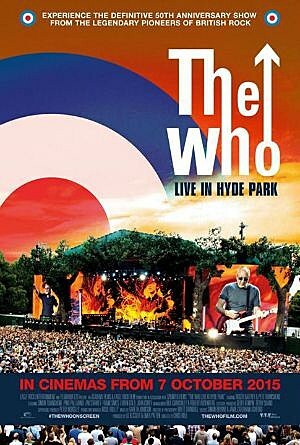 Specific showtimes and ticketing information have yet to be posted, but fans interested in catching a screening of The Who: Live at Hyde Park can register for email alerts at TheWhoFilm.com.